Q: Kimberly, we’ve known you as an EQ user for many, many years. I think you started with EQ3, didn’t you? How did you discover the software and first start using it? A: Yes, I have been a devoted user (I think you say I’m a groupie!) of EQ software since version 3. I was working full time as a graphic artist for a trade association outside of Washington, DC in the early 90’s. 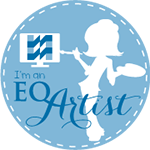 I discovered EQ while I was working part time in a quilt shop in Alexandria, VA. From the first time I started using EQ I was completely hooked! Q: On your site you mention you started sewing when you were seven. How did you start? A: My mother had grown up in the depression era and hated anything to do with sewing. But she had the wisdom to know I should have some basic sewing skills so she signed me up for some sewing classes when I was seven years old at the local Singer Sewing shop in Massillon, Ohio. I loved sewing from the start and it wasn’t long before I was making many of my own clothes. 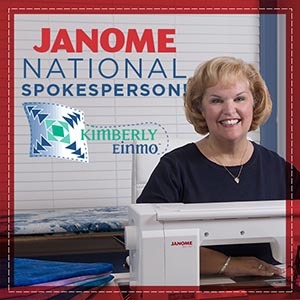 I joined a 4-H group when I was eight years old called “Buttons and Bows” where I learned even more about garment construction and crafts such as Christmas stockings, tote bags, and holiday décor items. I would enter my garments in the county fair every summer and I loved winning blue ribbons! For Christmas when I was 10 years old, my parents bought me a sturdy Singer sewing machine that had zig zag and hem stitches which at that time, were quite a big deal! They also surprised me with a cabinet to hold the machine. They were the best Christmas gifts I ever received! I still have that old Singer machine. However, it wasn’t until I walked into that quilt shop in Alexandria in 1991 when I realized you could piece blocks and quilt on a sewing machine. Q: I remember seeing you at International Quilt Festival in Houston, when I photographed you proudly showing your first book for AQS. A: I began teaching classes at that quilt shop in 1992. 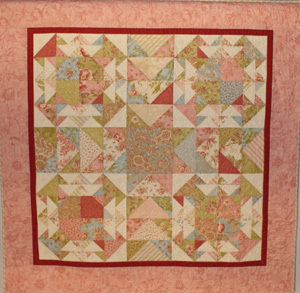 Using EQ software, I designed my very first quilt which became a mystery quilt class for the shop. 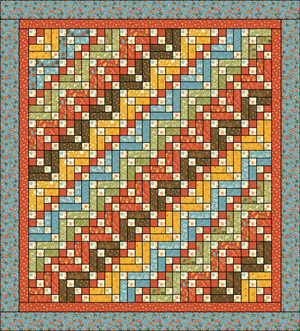 I decided it was much more fun to design my own quilts and teach them as classes than to use other published patterns. In the year 2000, my husband, two young sons and I were stationed in Ramstein, Germany, and I continued to teach classes through the quilt guild associated with the base. While living overseas I would buy fabric as “souvenirs” from every place we traveled. European fabric is very expensive so many times I couldn’t afford to buy very much. But we sure had fun looking for it! We never saved a dime during those four years stationed in Germany, but we traveled almost every weekend and saw so many cities and countries in Europe. All the while my husband, Kent, kept asking me “what are you going to do with all the fabric you’re buying from all the places we’ve visited?” Laughingly, I’d tell him “someday, I’ll write a book.” Finally, I decided to do it – and put all those amazing bits of foreign fabric to good use. I used EQ and Blockbase to combine blocks and images that reminded me of the places we’d been to create new designs and I used the fabrics I had purchased overseas to make the quilts. I put together a manuscript and sent it off to the American Quilter’s Society in 2004. Just as we were in the process of moving back to the United States, I received a phone call from an editor at AQS with the thrilling news they wanted to publish the book! The best part was finally being able to show my husband I had actually done something wonderful with all those expensive fabrics we had collected! Q: Your second book, Jelly Roll Quilts and More was about using small strips and other pre-cut fabric pieces to create quilts. I believe you designed the quilts using EQ. Did you? So then did you have to pre-plan that you would get a 2” finished strip out of a 2 ½” cut jelly roll strip, and design in finished sizes in EQ? 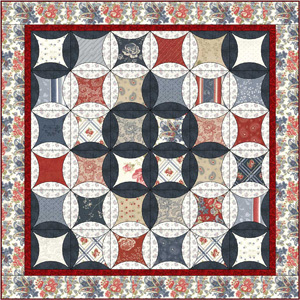 A: You bet – I designed all the quilts for Jelly Roll Quilts & More using EQ! In fact, it was a phone call in late 2008 from my editor at AQS asking me to write a book featuring Jelly Rolls that started the ball rolling. Even though I had never actually used strips from a Jelly Roll before, I gave her an enthusiastic “yes!” After I hung up the phone I began to panic. How on earth was I going to design an entire book of quilts using Jelly Rolls when I had never made a quilt from them? But I got to work and began playing with blocks and new designs in EQ. I found it extremely helpful to use only shades of white, gray and black. 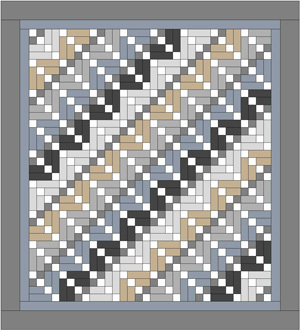 By removing the color and working in grayscale, I discovered that if a quilt design looked balanced and visually interesting in EQ, it wouldn’t matter what color, scale of print or fabric I used to actually construct the quilt as long as I followed the value as shown in the blocks. This was particularly helpful when designing quilts for Jelly Rolls and Precuts because you never know what particular fabric line someone will choose to make their version of the quilt. However, you can separate your 2½” strips into piles of lights, mediums, darks, and so on. As for the block sizes, I chose to use block sizes which were easily divisible by 2 (such as 6”, 8”, 10” and 12” blocks, etc) which made it easy to incorporate those 2 ½” unfinished strips. As for the finished book, I’m tickled to say it became the #1 best-selling book for AQS in 2010! Q: What turned your attention to working with jelly rolls, charm squares and more? A: After working with so many Jelly Rolls to make the quilts for Jelly Roll Quilts & More, it was easy to branch out to using other precuts. I love to use Layer Cakes (40 – 10” squares) and charm packs (5” squares). They work so well with 2½” strips and I found that I rarely had to cut any 1/8” increments to make basic units and blocks. You can truly expand your block options by adding these precut squares and it makes creating original designs all that much more fun! What most people don’t realize is if you can’t find a Jelly Roll in a particular line of fabric you like but you can find a Layer Cake, you can make your own Jelly Roll by cutting 4 – 2½” strips from a 10” square. Inch for inch, it is the same amount of fabric. 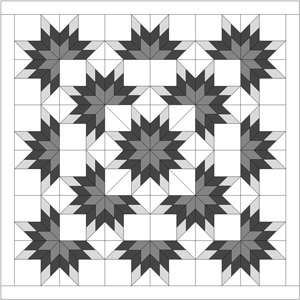 The possibilities for creating your own unique blocks and quilts from Precuts are truly endless, especially if you use EQ. A: You hit the nail on the head! I do love the sewing process, but my forte (and I think my favorite part) is to design quilts which only look complex yet are deceptively simple to construct. I try to take basic units and put them together in a unique way so they create a secondary design when you view the quilt as a whole. Almost all of my designs can be broken down into very simple blocks – such as nine patch or four patch blocks – which are sewn together in straight set rows. Many of my designs may look as though the blocks are set on the diagonal, but that’s just an illusion. I want people to look at my quilts and wonder how they are constructed. When they see my instructions and patterns, they have that light bulb “ah-ha!” moment where they say “Oh, I see. I can do that!” One of the nicest compliments I can receive is when someone tells me my designs or my quilts don’t look like typical Jelly Roll quilts! Q: Which are your favorite quilts from your new book, and why? 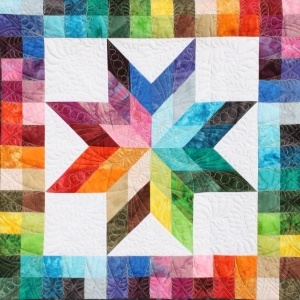 A: I really love the quilts made from strip-pieced diamonds such as Lone Starburst and Checkerboard Rainbow Star. After I finished writing Jelly Roll Quilts & More, I began to wonder what else I could do with Jelly Rolls. I felt I had only tapped the surface of design possibilities of using precuts. 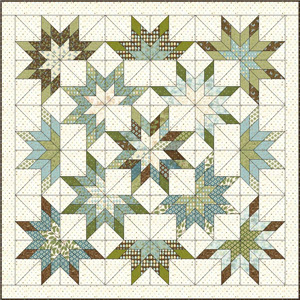 My dear friend, Birgit Schüller, who has expertly machine quilted many of the quilts in my books, created an award winning quilt from a Jelly Roll called Kansas Winter Stars. 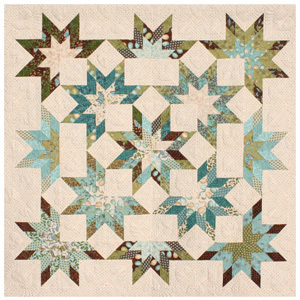 This quilt has won many awards internationally. I was so impressed with the concept of cutting strips into diamonds that I used EQ to create a new technique to piece straight-set blocks from diamonds without set-in or “Y” seams! By creating this revolutionary, easy block the possibilities are practically endless for designs you can create from diamonds cut from 2½” strip units! As for Checkerboard Rainbow Star, I wanted to effectively use a selection of rainbow fabrics from a Jelly Roll. So many people tell me they love rainbow Jelly Rolls – but they don’t know what to do with them. So by using EQ6, I found I could chart the color gradations and plan the fabric placement before I ever actually cut a single diamond or square! The quilt is simple and actually quite small – but oh, so effective! I also love Sticks and Stones and Faux Cathedral Windows. The best part was that I could literally audition the actual Moda fabrics in EQ before I ever made the first cut of fabric. What a time and money saver! First, I made the design in grayscale. Then I auditioned the fabrics. 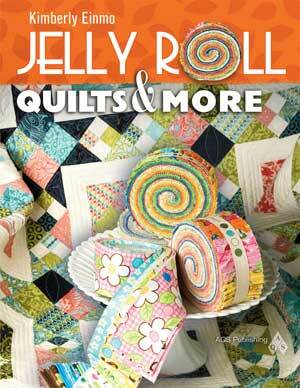 Q: I saw a mention of “How to host a jelly roll round robin” in a write-up about your new book. Can you tell me a bit about this. It sounds fun. A: It was so much fun! For many years I’ve kept in frequent contact with my dear friends I met through the base quilt guild while we were in Germany. Interestingly, our little group is quite international! There are two German gals, a gal from Holland, one from France, one from Great Britain, and me, from the US. We use email and Skype to keep in touch. When I was designing, writing and road testing the patterns for Jelly Roll Quilts & More, I asked several of these gals who were in the area at the time to spend a weekend with me in Stuttgart (where we lived from 2008 – 2009.) It was such a fantastic weekend; I called it a Jelly Roll Retreat. We even came up with a group name of Jelly Angels! I thought it would be fun to include a chapter about this event in that book, with lots of tips and ideas for others to host their own Jelly Roll Retreat. In my desire to keep us active and involved as a group even though we have since moved to different corners of the globe, I invited them to participate in a Global Jelly Roll Round Robin. We began by deciding on a line of fabrics we all liked, and I sent everyone in the group a Jelly Roll, matching charm pack and light background fabric. Birgit opted to use a dark brown background fabric with her Jelly Roll to see how the end result would be different. We each constructed a 20” center medallion block and then shipped the block and remaining fabrics to the next person on the list. I kept track of the status of our progress and we allowed several weeks for each border to be added to the center block before shipping the quilt-in-progress to the next person in line. 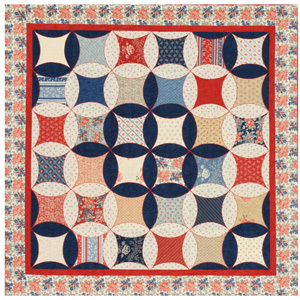 We were all amazed and elated at the end results – each quilt looks entirely different and it was such fun to end with a quilt made by each person in our little Jelly Angels group. Right now, we’re in the process of doing a Jelly Roll Row-by-Row Challenge. I can hardly wait to see how these quilts will turn out! We stay connected and are in almost daily contact with each other on Facebook, where we have formed our “Jelly Angels” group. Q: You must love teaching because you have an extensive travel schedule, and teach many weeks per month. When did that frenzy start? And how do you balance the pre-planning time and being-away time with creative time at home? A: The truth is I simply LOVE to teach quilting classes. And the larger the classes, the better! There is so much creative energy that flows when students are creating, talking, sharing, and learning new techniques which makes the entire process fun and rewarding. I love seeing those light bulb moments in class! But I admit that I do struggle with juggling my time effectively. There is never enough time for everything I want to do. I can tell you that the word “boredom” has never been in my vocabulary! Of course I want to be actively involved in our son’s busy lives, support my husband, spend time designing, writing, and the list goes on and on. I do get overwhelmed at times with so many deadlines. In actuality, I spend about 70% of my time working on the computer and only about 20% of my time actually sewing. 10% is spent doing administrative things, such as packaging and shipping my books and rulers to fill orders from my website. I wish I could reverse those percentages so I was sewing 70% of the time! I need to learn to balance my computer work with my actual creative time more effectively than I do now but I think it will be an ongoing process. As for teaching, I have a hard time turning down invitations to teach or lecture. I always return from a teaching engagement completely energized from having spent time with the students – getting to know them personally and circulating throughout the room making sure to give everyone hands-on attention so they have fun while learning. When students are in my classes, I always tell them “they’ve entered the no-stress zone.” They’re there to have fun and create! 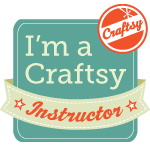 Q: Your site’s class list includes a Mystery Quilt class. How do these mystery quilt classes work? A: One of my other favorite things to do is to design and teach Mystery Quilt Classes. They are always so much fun and so liberating! 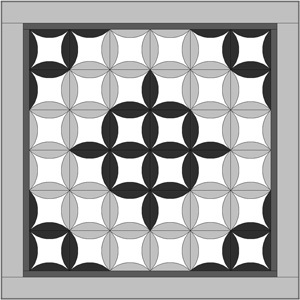 When I design a new quilt for a mystery class, I begin with an idea or a theme and then design only using grayscale so no matter what fabrics the students bring to class, as long as they have followed the color values I’ve outlined in the supply list, they will be able to construct a gorgeous quilt! No two quilts are ever the same which is why it is always so exciting at the end of the class to have the big “reveal.” I love all the oohs and aahs as everyone puts their blocks together to share their finished quilt top! And mystery quilt classes are uber-popular. Whenever I teach a mystery quilt class, it is always the first class to fill up! In some areas when I return to teach, we have mini- mystery quilt reunions! Q: You obviously love working with students, or you wouldn’t do so much of it. Is that just because you’re an extrovert? What does teaching give back to you that keeps you so enthusiastic? A: I do love teaching and interacting with the students, there is no doubt about it. But I find that I’m the one who is blessed in return! These ladies (and sometimes men!) share bits of their personal stories with me; their lives, their loves, their struggles, their kids and grandkids…. It means the world to me that they would care to share this part of themselves and I take it straight to heart. I never take for granted any person who comes to one of my classes. I realize many students save and plan for months in advance just to be there that particular day. They may have had to take vacation time from work. Or they had to drive long distances and stay in a motel. They may have had to find someone to care for their kids, grandkids, or an ailing relative at home – just so they could be there that day. So I feel a deep responsibility to make sure every moment they spend in one of my classes is a joy – not a frustration – and that they leave feeling rejuvenated, energized, encouraged, and happy they came to spend a day with me. I want each and every person to leave feeling as though it was one of their best days ever and time well spent. And I encourage students to keep in touch through email and to send photos of their quilts. I’m honored and thrilled when they do take time to contact me! And I answer every single letter or email I receive. 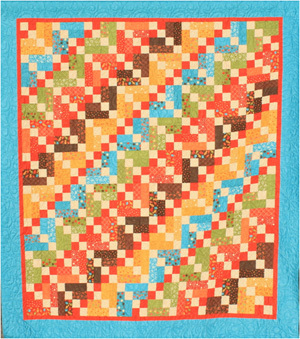 Q: Do you see new quilters in your classes, or are they mainly established quilters? 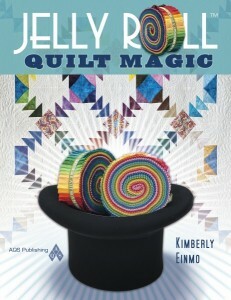 Thanks for sharing your story and some of your quilts with us Kimberly and congratulations on your newest book! Visit Kimberly’s web site. Thank you so much Penny, for giving me this incredible opportunity to share a little bit about myself with your readers! I will continue using EQ products. There is simply no other software on the market that compares with EQ! And you’ll be seeing more books from me in the near future. 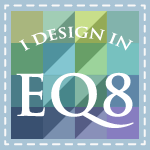 All my new quilts will be designed using EQ! Like I have always said, I think it is much harder to design quilts without using Electric Quilt software. I’m definitely your biggest cheerleader!